POSSIBLE MOTHERSHIP ACTIVITY IN 01-42S 055-02E AT 030739Z FEB. VESSELS ARE ADVISED TO KEEP 100 MILES CLEAR OF THIS POSITION AND TO EXERCISE EXTREME CAUTION. REPORTS TO UKMTO DUBAI, PHONE: 97 150 552 3215, E-MAIL: UKMTO@EIM.AE. M/V ATTACKED IN 16-29N 065-57E AT 031431Z FEB. VESSELS PASSING WITHIN 100 MILES ARE ADVISED TO EXERCISE EXTREME CAUTION. REPORTS TO UKMTO DUBAI, PHONE: 9 715 0552 3215, E-MAIL: UKMTO@EIM.AE. and their weekly Worldwide Threats to Shipping Reports. 02.02.2011: 0830 UTC: Posn: 20:16N – 063:36E, 225nm ESE of Ras al Hadd, Oman, (Off Somalia). About eight pirates in two skiffs armed with RPG and automatic weapons chased and fired upon a tanker underway. The tanker raised alarm, increased speed, contacted warship for assistance. The two skiffs kept firing with automatic weapons. Warship arrived at location and the skiffs stopped chasing and moved away. A helicopter from a warship arrived at location and circled the tanker. The helicopter contacted the pirates by VHF radio and ordered them to surrender their weapons. Pirates replied that they would kill the Iraqi and Pakistani hostages held onboard the mother ship if the warships attacked the skiffs. While not a reliable source, here is some anecdotal background. 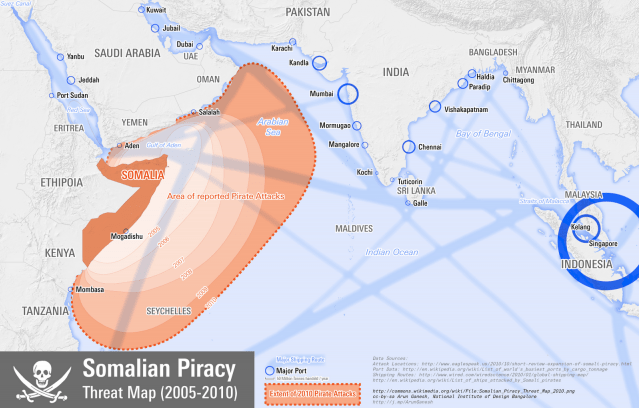 In 2009 Wired examined the Somali pirate business model. For interviews with both the Danish shipping CEO and the pirate negotiator, see our earlier dispatch Pirates Have Timesheets on a four-part NPR series. Also Somali pirates launch stock market. — Even pirates need a business plan. J. Peter Pham, an analyst of African affairs at the James Madison University, looks at the economics of guns, captains, and $2 million dropped into the sea in waterproof containers. Plus, Per Gullestrup, CEO of Danish shipping company Clipper Group, has dealt with pirates first-hand — he says they’re tough negotiators. Download the podcast; or subscribe. 3. That the pirates fill up the ship with fuel. Looks like the Stolt Strength, a Philippine tanker that was just released 5 months after pirates seized the ship, is probably wishing it demanded number 3 too. Dr. J Peter Pham just sent me a note saying it is dead in the water. It’s turning into a tragic comedy…I received word a couple of hours ago that the Stolt Strength, the phosphoric acid-carrying tanker that was let go two days ago was dead in the water 60 nautical miles off Somalia. They had consumed all their fuel during the five months in captivity. A German naval vessel checked in on it shortly after its release, but did nothing other than give the poor Filipinos enough food for three days. The owners are scrambling to get fuel up on a tug boat from Mombasa, but the crew is in a panic (I spoke with the master via satellite phone), fearing another pirate attack (except for the lack of fuel, the boat is an inviting target since its owners were willing to pay $2 million for its release). The problem with getting a tug boat up there is that the tug itself would be a target since the minimum distance from shore in international advisories is 200 nm. On the other hand, if someone doesn’t get the Stolt Strength out of there and its drifts so far as to run aground, it will be an environmental disaster.